The Battle of Austerlitz between France, Austria, and Russia on 2 December 1805 is also known as the Battle of the Three Emperors, because of the presence of Napoleon I, Alexander I, and Francis II & I. "However, Emperor Francis of Austria was not present at the battlefield." If he wasn't there, it would have to be called the Battle of the Two Emperors. So was Emperor Francis II & I present at the Battle of Austerlitz? It seems that Alexander and Francis were both present at the start of the battle, although I can find no sources that claim Francis remained with the allied armies after that. Alexander certainly seems to have remained in the vicinity all day, although he played little part in the battle. Although Tsar Alexander and Emperor Francis were nominally Commanders-in-Chief of the allied armies at Austerlitz, in practice command of the battle was in the hands of the field commanders, Kutuzov and von Weyrother. 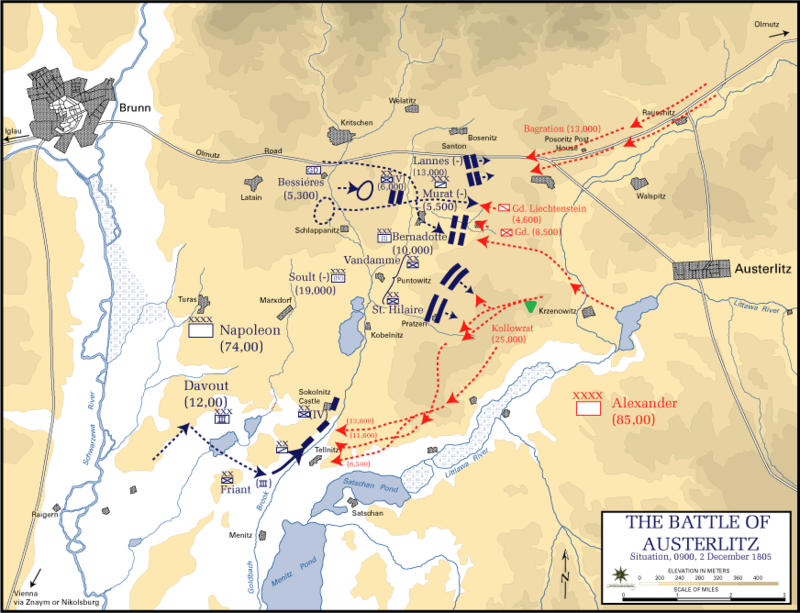 The Battle of the Three Emperors was the name given to the Battle of Austerlitz by the French. Alexander and Francis were nominally the Commanders-in-Chief of the allied armies, and so it was their armies that Napoleon defeated. "I have beaten the Austro-Russian army commanded by the two emperors. I am a little weary ..."
It really didn't matter exactly which Emperors took the field, or for how long. It is important to remember that, although Tsar Alexander and Emperor Francis were nominal Commanders-in-Chief of the allied armies at Austerlitz, in practice command of the battle was in the hands of the field commanders, Kutuzov and von Weyrother. Was Francis present at Austerlitz? "Surrounded very shortly by balls whistling about their ears, Alexander and Francis took less notice of them than of flies, but the Emperor of Austria, for his part, was unable to put up a good front in the face of the catastrophe and his sad countenance created a void around him." Near the peak of Staré Vinohrady, a fur-wrapped Tsar and the Austrian Emperor, having partaken of breakfast, consulted with a reticent Kutusov, whose anxieties had evidently not been allayed by several hours' sleep. "But we are not on the Empress' Meadows where we do not begin a parade until all the regiments are formed up!" This premature advance would be a major contributing factor in the congestion and disarray of the allied forces on the heights of Pratzen at the start of the battle. I am not aware of any mentions of Francis being present after that point. However, the allied headquarters was at Olmütz, so it is quite possible that Francis returned there once the battle began (he would have been little more than an observer on the battlefield from that point). Alexander certainly remained to the rear of the allied positions. The green triangle indicates Staré Vinohrady where we know Alexander and Kutuzov (together with the Imperial staff) were positioned shortly after 09:00. The earlier allied advance meant this was now well behind the allied lines. Unfortunately for them, this was also when when Vandamme's division began their advance from the Goldbach valley straight up the hill towards their position. After this, Alexander withdrew further, together with the Imperial staff, while Kutuzov attempted to salvage the situation below. .. because the Tsar was afraid to take over in case his favoured plan failed. as claimed on the Wikipedia page for the battle. The Battle of the Three Emperors was the name given to the battle by the French, and in reality it probably didn't matter which of those Emperors were actually present on the field. Alexander and Francis were nominally Commanders-in-Chief of those armies, and it was their armies that Napoleon had defeated. I remember being told that the name given to the battle was an allusion to the Battle of Ipsus, and intended to further enhance Napoleon's reputation. This claim was also made by William Belsham, in his Memoirs of the reign of George III (p 161), published in 1824. Not the answer you're looking for? Browse other questions tagged napoleonic-wars austria holy-roman-empire or ask your own question. What is the original French for Napoleon's quote “When your enemy is making a false move don't disturb him”? Did Gustavus Adolphus ever speak of making himself Emperor? Was the Battle of Trafalgar strategically pointless? At the Battle of Waterloo, why did the French army throw so many troops into the fight for Hougoumont? What is the manifestation of the Holy Roman Emperor reign in Italy? What is the line of descent from from emperor Louis III to Henry VII?